You're thinking of speaking in front of the Board of Supervisors and wondering what to say. Here's some ideas to help out. - Identify yourself as a Loudoun County taxpayer and voter. - Address your Supervisor directly. - If you have or will have kids in LCPS, say where they go to school. - Tell the Board you want the budget fully funded. - Mention ideas how to pay for it: maintain or raise the tax rate, reprioritize spending, etc. - Consider a gimmick. Sing a song, recite a poem, have your child speak. Feel free to exercise creativity. - Try a positive take. Most of the Board has expressed their support for our schools at some point. Find a comment you liked and let them know. Help them know it's ok to do the right thing. - Mention ways the School Board has addressed BOS concerns from the past two years: cutting benefit costs, reducing bus routes, conducting a search for a new superintendent. - Remember you have two minutes. It's not a lot of time. Time your comments once or twice. - After the hearing, send your comments to your supervisor and cc: loudounbudget@loudoun.gov reminding them what you said. Add any tips of your own in the comments! There are three public hearings on the budget scheduled: Wed, Feb 26 at 3pm and 6pm at the Loudoun County Government Center, 1 Harrison St. SE in Leesburg and Sat, March 1 at 9am at the School Administration building, 21000 Education Courtin Ashburn. Last year, about 50 people total spoke at the budget public hearings. The budget affects ALL of Loudoun County Public Schools' students. Are you going to show up? Call (703) 777-0200 to sign up to speak at at a public hearing. The School Board presented their proposed budget last night to the Board of Supervisors. It was a nice presentation, laying out their priorities and their justifications. The Board of Supervisors are going to need more convincing though. Surprisingly, many of the supervisors expressed that they didn't know the desires of their constituents. If you haven't yet, now's the time to let your supervisors know you support our schools as your number one priority. The School Board presented the results of the Community Priorities Survey they had done, where over 10,000 people responded, and 76% of them want "competitive salaries that attract the best employees" to our schools. Supervisor Volpe, though, asked if any of those survey respondents were from her district (zip code 20165). Hasn't she heard from you yet? If you're in the Algonkian District, send her an email at suzanne.volpe@loudoun.govand cc: loudounbudget@loudoun.gov. Tell her you support that too. Supervisor Williams wonders why we care so much about teachers' salaries if we're not teachers ourselves. Do you live in the Broad Run District (Broadlands, Ashburn Village, and more)? If you're not a teacher, he needs to hear from you that you support full funding of the budget. Is Eagle Ridge your middle school? Tell him you want the 1:1 initiative expanded there like the budget proposes. Email him at Shawn.Williams@loudoun.gov and cc: loudounbudget@loudoun.gov. Supervisor Buona would like to know what you want to cut from the budget so that he can lower our taxes. He supports reducing class sizes, increasing teacher salaries and improving technology. He just thinks we can get rid of some of that other stuff and fit it all in. What do you think? Do you live in the Ashburn district (Ashburn Farm, Lansdowne and more)? Let him know whether your priority is lowering your taxes or if you would rather support our schools. Email him at Ralph.Buona@loudoun.gov and cc: loudounbudget@loudoun.gov. Supervisor Clarke thinks maybe teachers would rather keep their property taxes low than get their step increase on the revised salary scale. She also wonders whether parents of students where full-day kindergarten would be expanded would be more hurt by a property tax increase than helped by full-day kindergarten. (Property tax increase to fully fund the budget would cost most families around $300 per year. After-school care for a kindergartner for a year is a lot more than $300!!). Are you a teacher who lives in Loudoun? Will you have a kindergartner at Middleburg, Forest Grove, Sterling, Meadowland, or Frederick Douglass? Are you in the Blue Ridge district (Brambleton, southwest Loudoun)? Email her at janet.clarke@loudoun.gov and cc: loudounbudget@loudoun.gov. Supervisor Letourneau thinks that we don't need to fix the salary scale to be competitive with our neighbors because turnover is low and our cost of living is lower. Folks, these people think they're representing you. Are they? Do you live in the Dulles district (South Riding, Loudoun Valley Estates)? Email him at Matt.Letourneau@loudoun.gov and cc: loudounbudget@loudoun.gov. Here's the kicker. Supervisor Scott York represents all of us in Loudoun County. 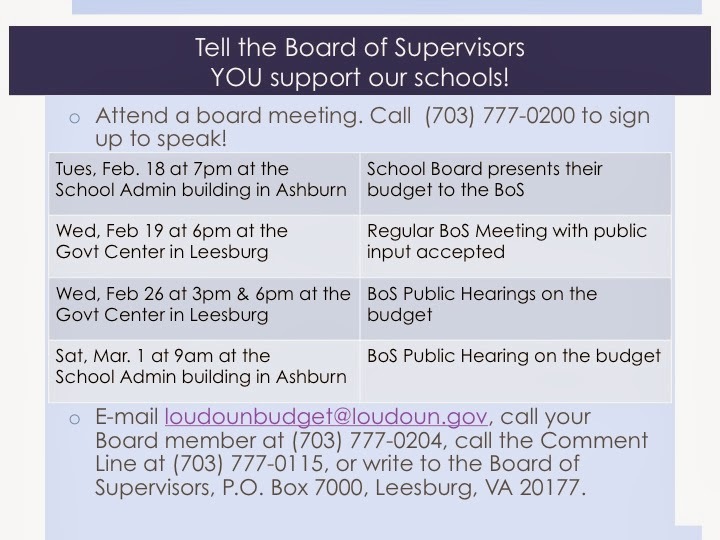 He said that public input is taken at every Board of Supervisors business meeting, that there are public hearings coming up on February 26 in Leesburg and March 1 in Ashburn, and that is your chance to tell the Board of Supervisors what you want from them. Then, he said that the School Board's budget will not be fully funded. Hmm. Contact him too and let him know what you think about that. Email him at Scott.York@loudoun.gov and cc: loudounbudget@loudoun.gov. Maybe your supervisor didn't make the comments highlights, but you should still email him and cc loudounbudget@loudoun.gov. Catoctin district - Geary.Higgins@loudoun.gov, Sterling district - Eugene.Delgaudio@loudoun.gov, Leesburg district - Ken.Reid@loudoun.gov (Mr. Reid was not present at the meeting). You can also call your Supervisors at (703) 777-0204 to talk. Sign up to speak at a meeting or public hearing by calling (703) 777-0200. The County Administrator has proposed a tax rate of $1.155. He advertised a rate of $1.215, which would fully cover the School Board proposed budget. So how much money are we talking about? This chart is filled in with an example. Customize it using your assessment values to see how it would change your taxes. With the first battles won, the fight now goes on to the Board of Supervisors. 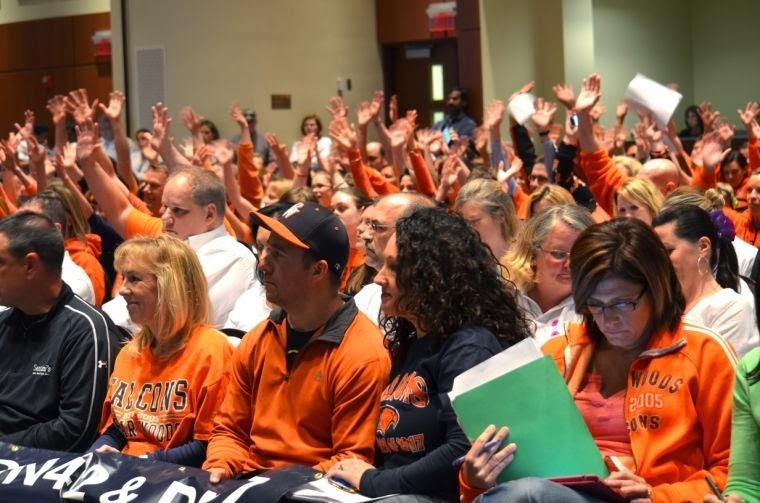 They have scheduled three public hearings, two on February 26 at the Leesburg Government Center, and one on Saturday, March 1 at the School Administration building in Ashburn. The School Board over the past two years has cut employee benefits and cut the transportation budget, both items that the Board of Supervisors have mentioned in the past as ripe for cuts. During last year's budget talks, Board of Supervisors Chairman Scott York said, “Change is good, and my words today to the School Board: Change needs to happen at the top of the administration. Dr. Hatrick has served this county well for many years, but we are now in the 21st century. Many things have to change. And unfortunately sometimes in order for change to happen change has to first happen at the top.” Two months later, Dr. Hatrick announced his retirement. The Board of Supervisors have gotten what they asked for from the School Board. The advertised tax rate of $1.215 would cover the proposed School Board budget, but the Board of Supervisors has asked for an equalized rate of $1.155, cutting an estimated $40 million from that budget. The BoS has set aside 2 cents of that revenue for transportation, even though our state sales tax was increased this year in order to pay for transportation. Tell the Board of Supervisors to fully fund the School Board budget. It's time. Call (703) 777-0200 to speak at a meeting and email loudounbudget@loudoun.gov today. Lots of you are very informed on the process of the schools budget by now, but just in case, a quick recap: first, the Superintendent proposes his budget -- that happened January 7; next, the School Board will adopt a budget -- that happens this Tuesday, February 4; after that, the Board of Supervisors will adopt a budget on April 2; finally, the School Board will need to reconcile any difference in their request and the final budget from the Board of Supervisors. It's a marathon, not a sprint, and the first leg is almost over. Not quite yet of course. You still have time to let the School Board know what you think they should do. Here's the rub: you won't know that you don't want them to cut something they are thinking of cutting until they happen -- and that won't be until it's over. The process is public though, and all the work sessions and budget discussions are online and the questions and answers the School Board has asked are online too (albeit a bit hard to find - some are here and some here some here. 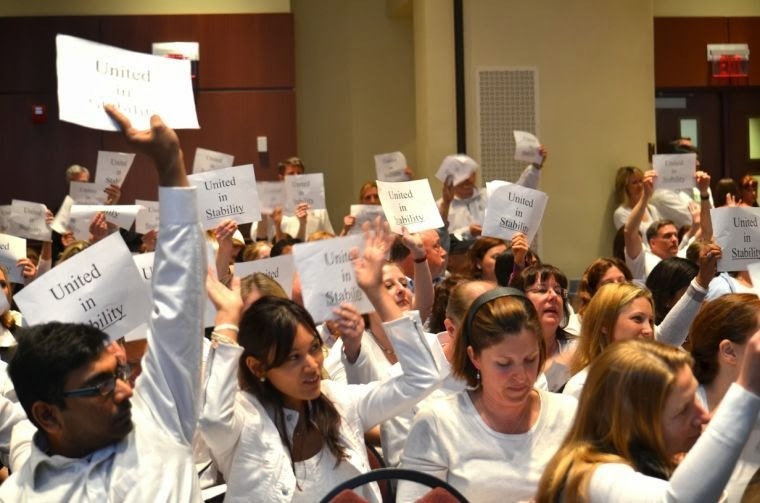 It seems the School Board is set to increase teacher salaries and revise the salary scale to better position Loudoun for the future. They have talked about the positive feedback they've received from the community on this issue. The questions also provide some clarity to the proposed LCPS budget. Some of the increase in staffing is an attempt to lower class sizes at the elementary level, which wasn't spelled out clearly at first. This sounds like it has support from the School Board as well. Finally, School Board member Brenda Sheridan sounds like she is planning to propose expanding full-day kindergarten to five more schools with high populations of at-risk students. The School Board adopts their budget request on Tuesday, February 4, so contact your representatives now to let them know your final thoughts. Then be prepared for the quick turnaround to the Board of Supervisors to convince them to provide the funding needed for the proposed budget! The County Administrator will be presenting his first draft on Wednesday, February 5 to the Board of Supervisors at 4pm.